The last Club Night was not the best of weather but it didn't stop two of you turning up in your MGs, Cliff's red CGT looks very nice and David even had the roof down, well done. Again there was over 40 of us in the restaurant, what did you all think of the 'Slide Show' that Norman had put together and he was good enough to bring in 2 monitors so, everyone had a chance to see them (except when Fred was standing in front of the one on the bar!!!). Many thanks Norman. Cars would attend at the Fleece from about 11.30am. Other cars will include Morgan, Triumph and MG marques. Complementary light refreshments will be served and there will be entertainment from Vintage Singer Betsy Harmony and others. At approximately 12.45 cars will leave for a Navigational Scatter event based around themed Asparagus clues throughout Worcestershire. Expected return to the Fleece Inn for about 4pm-5pm when a complimentary Asparagus Tea will be served to all contestants along with a complimentary Asparagus Goody bag. If anyone is interested let me know and I will pass the info on. 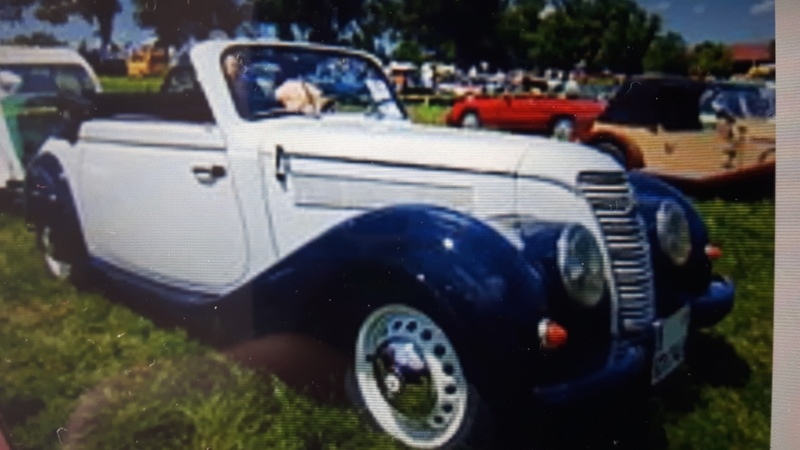 As you will all know by now, Drive-it-Day is a nationwide activity arranged by the FBHVC to encourage all classic car owners to take their vehicles out to show that they are used and of importance to the history of the country. For many years now we have organised a run on this event and this year is no exception. Richard Avery has again stepped forward and has organised the day for us, so for the run he has booked us into The Southcrest Manor Hotel, Southcrest, Redditch, B97 4JS, where lunch will be available. The start will be from the Golden Cross, meet from 11am to be ready to leave around 11.30 and the scenic run is about 40 miles through the local lanes. There are 21 cars and 39 people booked in for the lunch, it may be too late to join in now but if you haven't booked and would like to, you need to check with Richard, the booking form is still available on the Club website. Social gathering at the Golden Cross. Bank Holiday Monday, at Bidford airfield (off Buckle St, due South of Bidford). This is getting to be a popular event, no need to book just turn up and all they ask is for a donation into their collecting bucket. We are trying a new format this year with three distinct stopping places to get out of the car and look for the clues to answer the questions, rather than looking for the clues as you drive along. We are also trying a new idea of having the run in the late afternoon on a Sunday (starting from 17.00 to 17.30), however the finish will be at a suitable venue for a meal. Please let me know what you think. Graham and Lech are working together on the quiz, so it should be good!! THE FINAL PAYMENT IS REQUIRED BY THE MAY CLUB NIGHT, SO IF YOU HAVEN'T GIVEN NIGEL THE PAYMENT BRING YOUR CHEQUE FOR £340 TO THE MEETING ON MAY 7th. Nigel has now organised his 'summer run' and it will start from the Golden Cross. There will be a scenic run of approximately 40 miles through some of the Cotswold's finest countryside to finish at The Fleece Inn at Bretforton, where a 'Summer BBQ' will be served. The cost for the BBQ is £15.00 which will comprise of: Homemade Burgers, Locally Sourced Sausages, Cajun Chicken Breast, Parsley Battered Corn on the Cob, Cheesey Chips, Tomato, Mozzarella and Basil Salad, Wholegrain Mustard Coleslaw Mixed Green Salad, Roasted Red Pepper and Mixed Olive Salad, Selection of Artisan Breads and a Selection of Relished& Sauces. We will be able to display our cars in the orchard and there will be seating and a bar in the barn for use by the Club. Booking and payment is essential to Nigel as soon as possible as he needs to provide the venue with the numbers for the food. I will load a booking form onto the Club website. A social evening where you can show off your pride and joy and win some prizes, so make sure you have cleaned, polished and waxed your car. We will again have a display at this show at the British Motor Museum. I will be asking for bookings nearer the time but it should be free to enter (when booked) which gives access to the show and both museum buildings. There has been a good turnout the last 2 years. Steve will again be looking for support for the excellent show (can you arrange better weather this year Steve) and maybe we can talk Alan & the Team into another 'food tent'. More info nearer the time. Advance notice, to be confirmed. A regular event on our calendar. This is a new show which we think we should give a try and this will be in place of the Plum Festival. The location is just outside Banbury and we may organise a scenic run to get there. More details soon. This will no longer be a 'Club Event', however anyone can book to attend, Alan will have bookings forms nearer the time. One of the last outdoor events of the year, lets hope for better weather than last year. MGCC Midland Centre Welsh Rallye - 17th to 19th May 2019:This year's Rally will be based at the Hands Hotel in Llangollen and will again be a 2 night event. I'm told the run on the Saturday will be slightly shorter than last year and will have an additional short cut if required. Further details from the Midland Centre. Saturday 7th& Sunday 8th September 2019 – The Peaks to Lakes Run: The Cat & Fiddle, Peak District to Wrynoes Pass, Lake District. Details from Norman Verona, email: norman@frenchblat.com . Message from Norman Verona: There are a few places left on the Peaks to Lakes Run for September (now 2 separate events). The Saturday will be the run around the Peak District and Sunday will be the run around the Lakes. Participants can elect to do the Peaks only, the Lakes only or both. 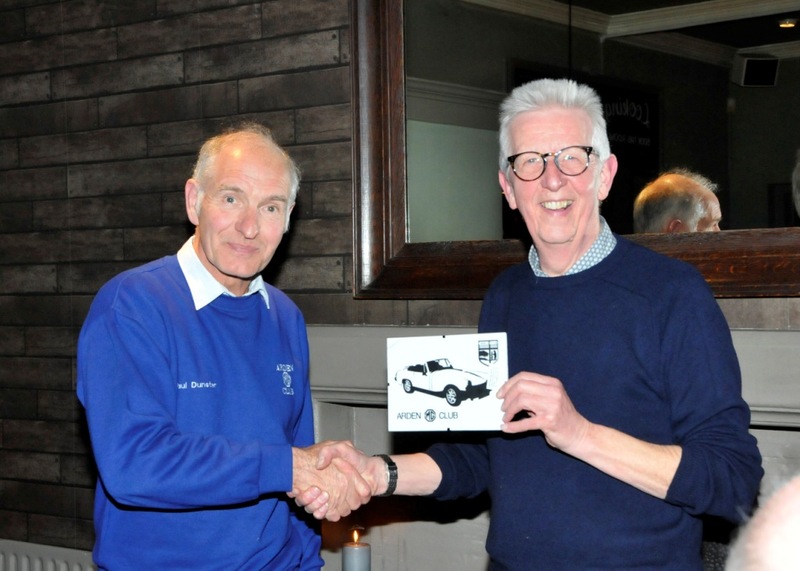 Those of you who read the Newsletter may remember the comment in Graham's 'What Have I done in My MG' that there was a Jeep pedal car in the background of one of his photos. He has sent a follow up message: “I found the picture of my jeep I was looking for . . .
Here’s another car recognition quiz if you want to use it as a filler, they are both from the same factory made in quantities but oddly the same car came out under two different badges, long before the badging of Nuffield products etc. I have still got a bottle of Old Speckled Hen left for the first correct answer I receive. What did I do this winter? I changed the seats in my MGC. This is a tail of interesting advice and knowing the right people who know the right people. The C seats are not the same as B seats as the floor pan in the C is different due to different front suspension and a rather large engine. The reason for the change was to add head rests and also reclining seats, not available for the C (68/69) only coming in for the B in 1972. What prompted me to get on and change the seats was an incident that happened to an old friend of mine Brian Rainbow. Some of you will know him as Chairman of the MG Octagon club and he runs the pre MG 1956 natter at the Blue Boar every month. He was returning from an MG event in his B GT one Sunday and stopped at a set of lights at a temporary road works and was hit from behind by a white van, the driver was on his phone!! I have seen other Cs where the seats have been replaced. 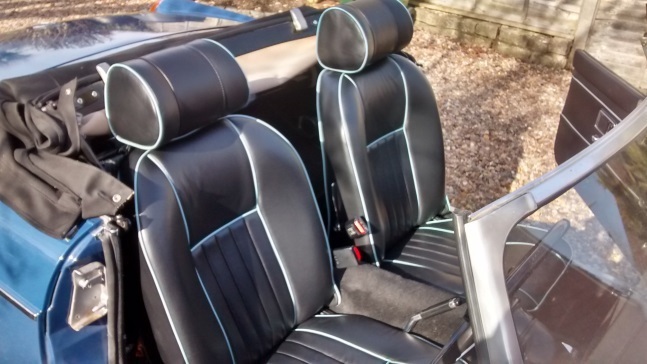 However they tend to be of two types either from a Mazda MX5 or MGB seats, usually from the Owners Club. If I was going to change them I wanted them to be as close to original looking as possible so I was not going the Mazda route. I had great fun ringing around trying to find out if B seats would fit. I received some interesting and wonderful advice. The Owners Club said their seats would be OK “they have sold many to C owners”, in a later call, a different person, told me quite a few had been returned. 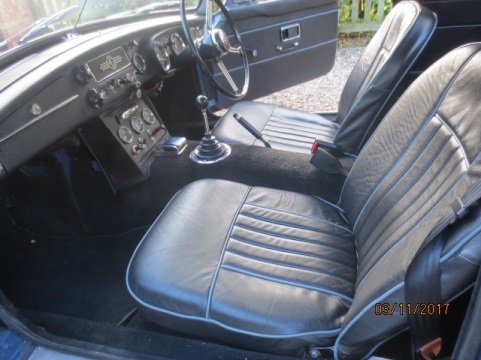 Other advice I was given was “only MGB GT seats would fit the C”, and “post 1976 B cloth seats would fit”. Due to the difference in the C and B seats if you put in B seats you will have to change the C steering wheel so you can get your knees under the wheel. I had just changed mine to an original wheel so did not want to go back. Anyone want a wood rimed Moto-Lita steering wheel??? I decided to go the DIY route and went to Ebay and found a pair of 1972 B seats for £25 plus £15 postage. I stripped them down only to find they had different Head Rest holders. Single post and double post. Ugh. They sent me another free of charge, great. However it was a good job I had a spare as I found that the reclining mechanism on one was broken so I swapped the bases. I measured the C seats and worked out the difference in the height was at the front and was 4cm. I took the bases to a man in Alcester (thanks Lech, knowing someone who knows someone) who cut them down and re welded them. A quick rust proof and paint and they went off to be covered. In my research on good trim people the name of PJM Motors kept on coming up. Again a name from someone who knows someone. They deal almost entirely in MG trim and can provide just about any finish. Sandra who answers the phone but really organises the place went through everything, what sort of leather, sending me a couple swatches to compare with the current seats, what type and colour piping etc. Sandra said it would be 3 weeks and exactly 3 weeks later she rang to say they were ready. Now they are fitted and the C is ready to go and yes just in case you did want to ask the tank is full. The only problem being I have had a knee operation and supposed not to drive for 6 weeks Ugh.. Thanks to all the contributors, please keep sending me your stories, even better with a photo or two. We waved goodbye to Stephanie's Mini, then began discussions on what we were going to do next in the way of cars. 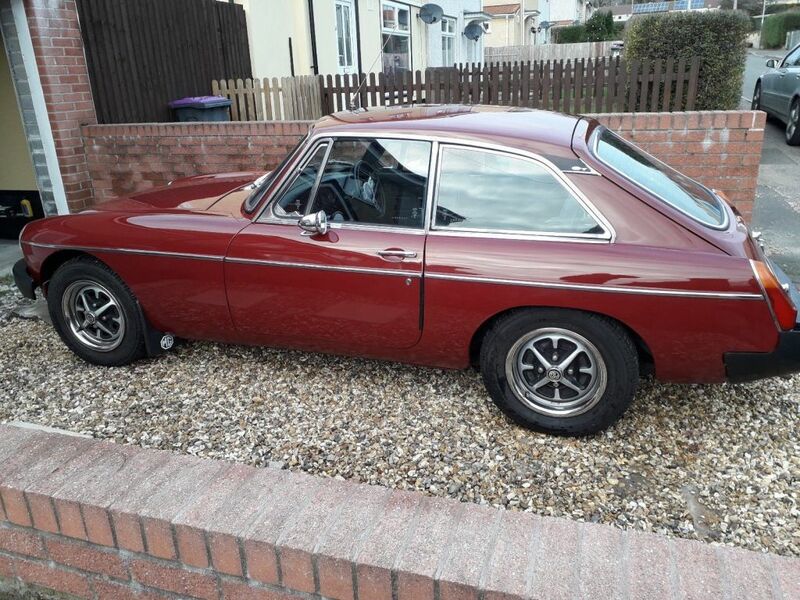 It was suggested by way of mutual consent, to look for an MGB GT giving us some cover on wet runs and as a second vehicle, we would be Tax free with cheap insurance and it would also increase in value. We went through all the usual channels such as Autotrader, Gumtree (etc) and on ebay found several likely cars but nothing seemed to hit home. That is until I found the advert which just seemed to click. I had a good feeling about this one. My first bid was rejected and several other bidders came on the scene. I left a message for the owner one Saturday night and disappeared to the pub. We had been there about an hour when my phone rang and it was the seller. We discussed what he wanted price wise, to which I made him an offer which he accepted on the promise to keep the vehicle until we arrived to see it and complete the deal. On the Tuesday morning Stephanie and I set sail for Pontypool in South Wales. We eventually found the place and in dicussion with the owner who was an MG enthusiast found he had had it for four years but two of those it had been garaged and never seen the light of day. He was a Builder starting up on his own and had just moved from Bristol to South Wales and needed the money to help in the new buisiness. We did the deal there and then and being a man of his word had refused a higher offer until we had seen it. I drove it back home across the Brecon Beacons and we made it back safely, it ran quite nicely. I then did some TLC on her and wrote to DVLA to find who the other owners had been, although I had quite a large piece of History on her I wanted a bit more. Having wrtten to the addresses of the last four owners one phoned me quite delighted I had the car and bothered to get in touch. I am very pleased I did for when he had it in 2012 he had a complete renovation carried out, Leather seats, Trim, New S/S Exhaust, a complete Engine overhaul including an unleaded Head, New suspension, New instrumentation, Respray, the list went on. On looking through the History I have found all the Receipts of the work carried out and it all matches. He sold it when his wife died, as they were active in his local MG club. I have since found it started life as a British Leyland company car at Longbridge so she has come back to the Midlands. Havok our Red Roadster now has a sister! AWK ! Stephanie was complaining of her mascots the two Dogs Winston and his mate Churchill kept falling off the back seats - they now have safety belts to keep them in place !! We look forward to some runs in her. Thanks Nigel, I look forward to seeing at this years events, although if it is the wet weather car hopefully not too many events!!! 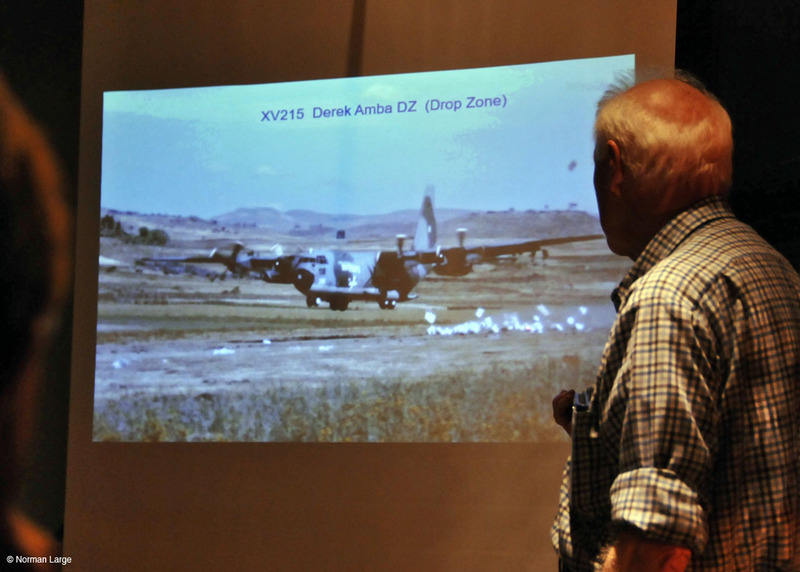 I think everyone who came to the Club Night enjoyed the talk by Patrick about his time in the RAF flying Hercules (Lockheed C130K) Aircraft (remember never call them planes!! 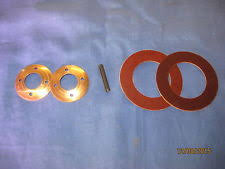 ), which was after working for the other Lockheed (Automotive Products). 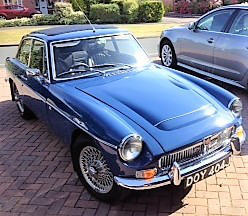 Patrick has a connection to MG having bought a 'B' new in 1969 (which he considers to be the best model year, still with leather seats but ones that reclined, does everyone agree?). The main advantage of the Turbo Prop aircraft is their short take-off and landing (STOL) ability, as well their low level flying capability, this was demonstrated with a short video showing the 'food relief drops' at Addis Ababa during Operation Bushel in 1985. He finished with some anecdotes about his time flying Andovers on the 'Royal Flight' but best to keep them to ourselves!! A great talk and we presented Patrick with the £60 takings from the evenings raffle but this was very generously increased to £100 by Mike Green and will be presented to Parkinsons UK as his wife is a sufferer. We now know the details for this run, which will start at the Golden Cross from 10.30am and plan to leave around 11.00/11.15. There will be an interesting scenic run to finish at The Henley Golf & Country Club. Lunch will be available but needed to be pre-booked and paid for. The deadline for bookings was the March Club Night, please contact Alan Cleobury for any further details. The booking form is still available to download from the Club website. Alan has been taking bookings for this show. Please make cheques payable to Arden MG Club. Completed forms required by April Club Night (Tues 2nd). Nigel is not content to be just organising the weekend away and has offered to arrange a run out for lunch as well, details will be available soon but put the date in your diary/calendar. Saturday 7th & Sunday 8th September 2019 - The Peaks to Lakes Run: The Cat & Fiddle, Peak District to Wrynoes Pass, Lake District. Details from Norman Verona, email: norman@frenchblat.com . 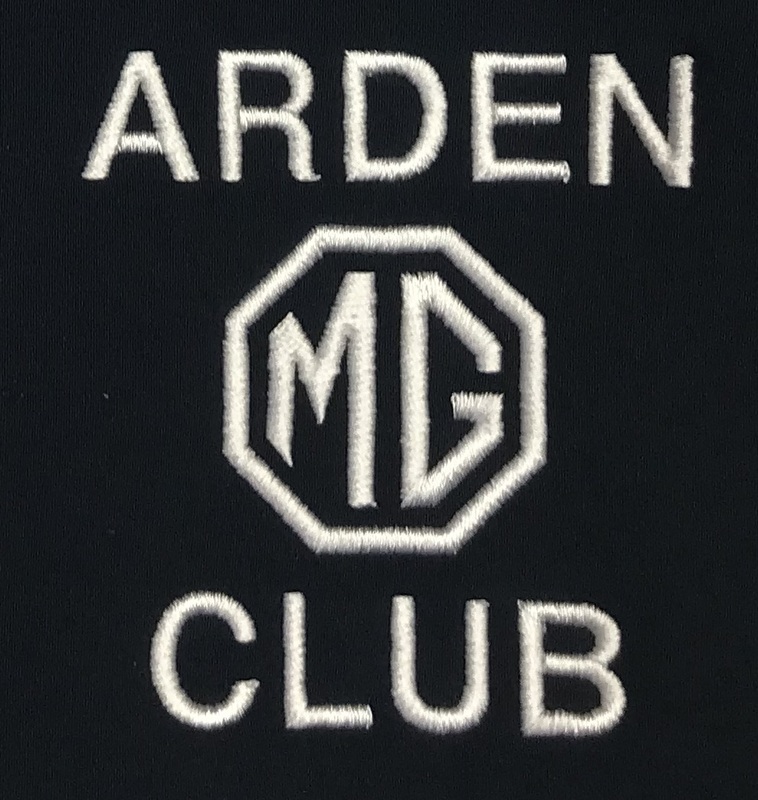 I have found a new supplier for Arden MG Club branded clothing, which is reasonable quality at an acceptable cost. I will be collating a bulk order to place with the supplier and we should then be able to save the carriage cost, in the future it should be possible to order individual items direct from the supplier, however the carriage costs will apply. The 'branding' will be the Club badge as used on previous clothing (not the shield) as per the photo which can be in a contrasting colour to the garment. The range will consist of Men's Polo Shirts, Ladies Polo Shirts, Sweat Shirts, Fleece and Woolly Ski Hats. Attached are the full details, which are also shown on the Club website. If you would like to order any of the items please let me know and let me have the payment (cheques to 'Arden MG Club'). Please note the prices are the cost to the Club and the set-up cost will be funded by the Club funds. I would like to be able to place the order just after the April Club night. More good news we have decided to buy a new banner to advertise who we are when we are at events. The new one will have a rectangular frame that the banner will attach to with bungee straps and will be much easier to put up and carry around. Look out for it at an event soon. MGCC: As some of you may know, for some time the Midland Centre has been looking for a site to run an Autosolo. This is a forward only version of an autotest ideal for unmodified road cars, they must be driven to the event and have an MOT, although this can vary depending on the regulation. The rules allow for a passenger as young as 12 and a driver aged 14, though not in the same car! Curborough is the venue we have in mind, and the MGCC already has an invitation from the Cannock and District Car Club to compete there. If you want a fun day out then visit http://www.cdcc.org.uk or see them on Facebook. An ideal opportunity to exercise your daily driver and still get to work on Monday morning. Other events may be open to MGCC members, but may not be held at Curborough. Anyone interested in taking part in any of these events should contact the Cannock & District Car Club directly. Their website contains details of entry forms and regulations. 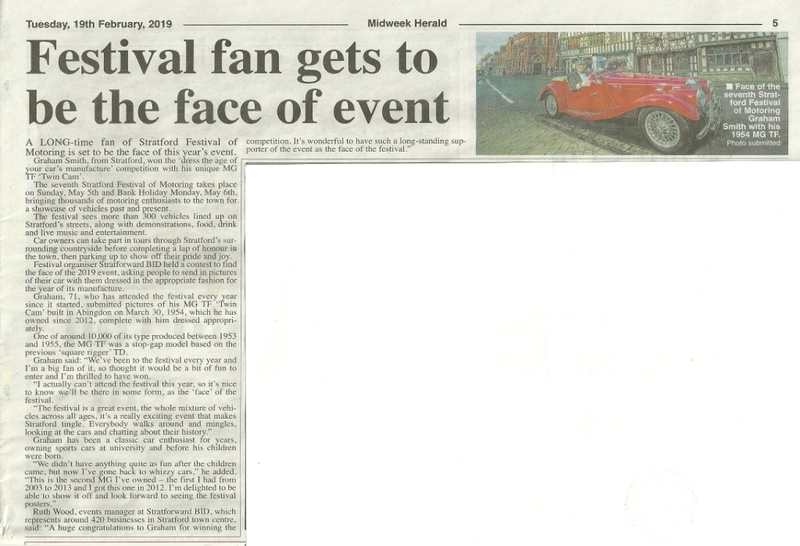 Those of you who are local to Stratford may have seen this article in the local paper, however for those who didn't see it here is Graham Smith with his special MG TF Midget (Twin Cam) who has become 'The Face' of the Stratford Festival of Motoring. Well done Graham. The Festival is over the early May bank holiday weekend (Sunday & Monday) with scenic runs around the area and then displaying the cars in the town centre. 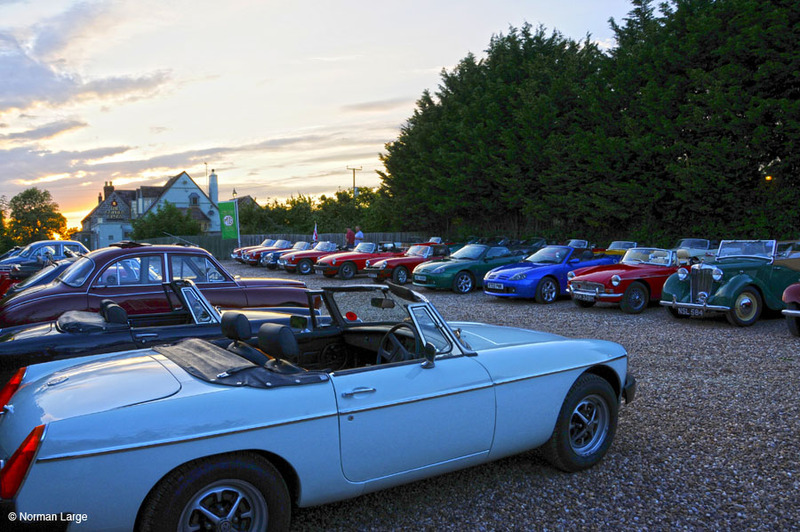 Although this is not an Arden MG Club events, lots of us take part, it is great fun but you do need to book with the organisers; 'Stratforward'. I will be taking part on the Sunday and with the British Motor Museum on the Monday, hope to see you there. Well - to be honest, all I did personally with my MG was drive it to Cotswold Motor Co just outside Long Marston for it to have bottom-half respray. 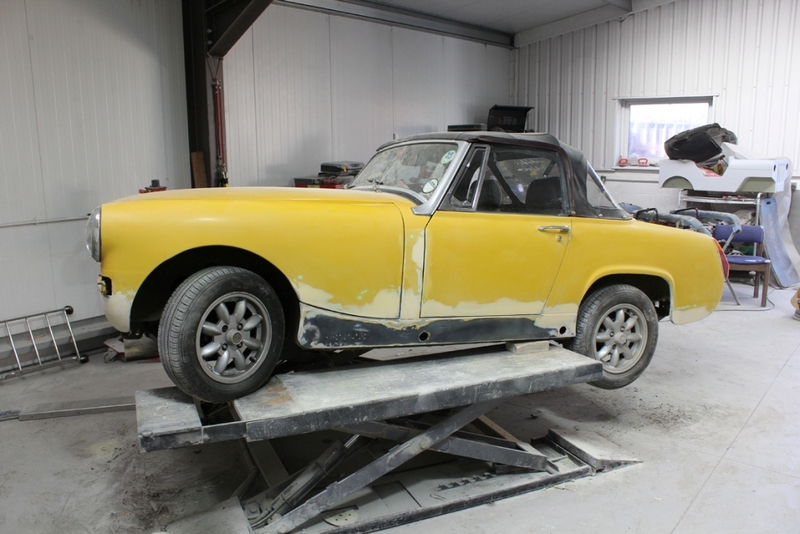 It was obviously the end of a hard day there, as the staff gathered round my treasured little MG Midget and studied it, with slowly lowering brows. It's got a few bits of bubbly paint, and a seam on the front wing has developed a rather fetching "lace doily" finish. Trust me. you could have successfully vacuumed the yard with the amount of sharply intaken breath they exhibited. They obviously have a repertoire of damning comments they draw on so that you don't go away with the idea their job is simple. Ones like "how big's your budget", or "which scrap yard do you favour" . . . "you never know what's going on underneath" . . . "hope we can get that wing off" . . . the trick is to let them run on until they realise the sun's going down and it's time to go home. The following day, the gaffer, Dave, who is a hero in my book, rings and says "it's not too bad really. I'm afraid you'll need a new wing 'cause that's beyond hope, but we can do all the rest for you, won't be too bad at all". And he quotes a price which is well within the budget. Which means he's either cocked up his estimate or I'd just reserved too much. Now is a REALLY bad time for any members to tell me they've got a brand new MG Midget 1500 front offside wing I can have for £30. On the passenger's side pic there's a Willys jeep pedal car they are making, in the background. I had one like that when I was about 5!! Thanks Graham, I'm looking forward to seeing the sparkling paintwork. Whilst we were in Sri Lanka (yes we've been away again!!!) I saw several new MG cars but only managed these 2 photos of the new ZS. I saw more new MGs there in 2 weeks than at home in 2 months!! Someone said they were probably from the new factory in India. Whilst I was under the car daydreaming, I thought that now I've got rid of the "clunk", wouldn't it be nice to get rid of the "click". You know that annoying "click - click - click" from the SU Fuel Pump on its last legs, I have in the past rebuilt these but as this one was a Jap copy, there wasn't a hope in hell it would have been worth it, so I fitted a new SU Fuel Pump as well just for good measure, and the by far the most expensive item at over £100, and just to be on the safe side new flexible fuel pipes as well. That's all Folks, so far, Safe & Happy "MotorinG", and "C" you at the next meet. "I was hoping that you could help me locate my old MGBGT, I was looking through some old photos and came across this photo Of me [with hair ha ha ] and my MG. I bought it new in 1975. 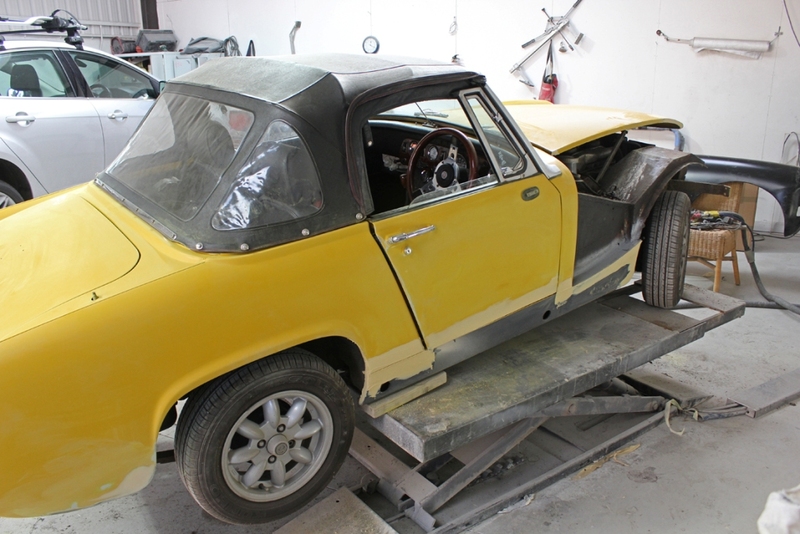 Because the MGB had been made for some years prior to 1975 they were well know for rusting out very quickly so I decided to have the bodywork injected with the, new at the time, Cadullac sealant [spelling] and the paintwork treated with Armarglaze [also new at the time]. this is the reason I would like to to find the car to see if the treatment worked all these years later, or did I waste my money? Unfortunately I only got to own the car for about a year due to financial problems and sold it to a gentleman I believe lived in Wimborne Dorset, I have tried to find the owner of the car via the DVLA they of course and quite rightly wont give out the name of the registered owner, the car is still on the road and is MOT'd. So if any of you nice people know of it's whereabouts or it's with your club, I would be greatfull if you could help me find the owner to see if I did waste my money. 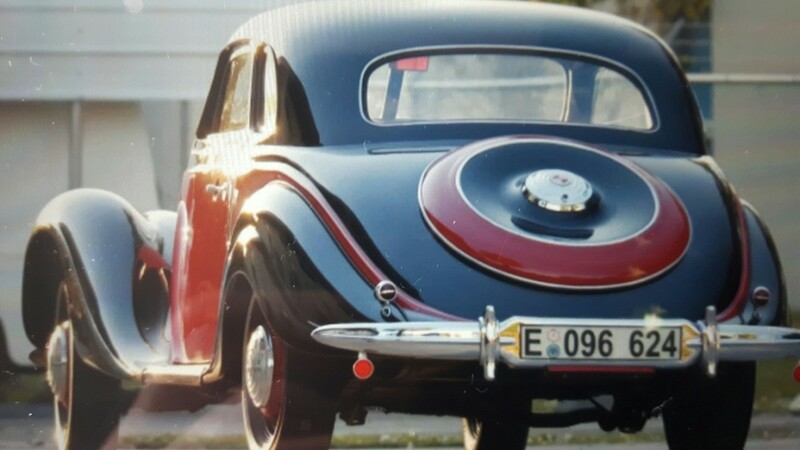 I was living in Bournemouth at the time I now live in Malta retired and enjoying the warmer weather and loving the classic car clubs with my Rover P5B Coupe. 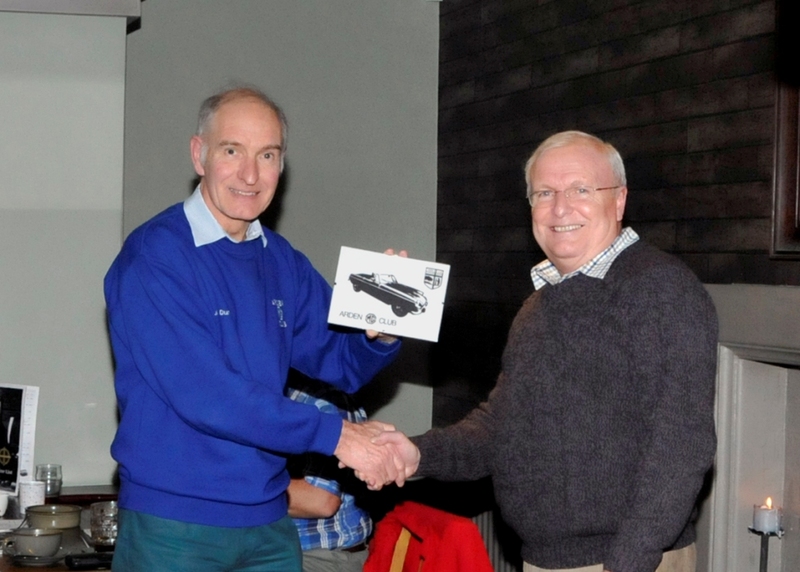 No events to report on this month but we still had a good turnout for the Club night with over 40 of you there, however I did have the chance to present Graham with a token of thanks for the work he put in for the Club's 30th Anniversary last year. As with Norman last month I presented Graham with a laser cut 'shadow' picture of his Midget and he was very impressed with the accuracy as it showed the rust on the 'A' pillar!! Thanks again to Chris Jarman for spending the hours on the design work to produce the 'shadow' format. 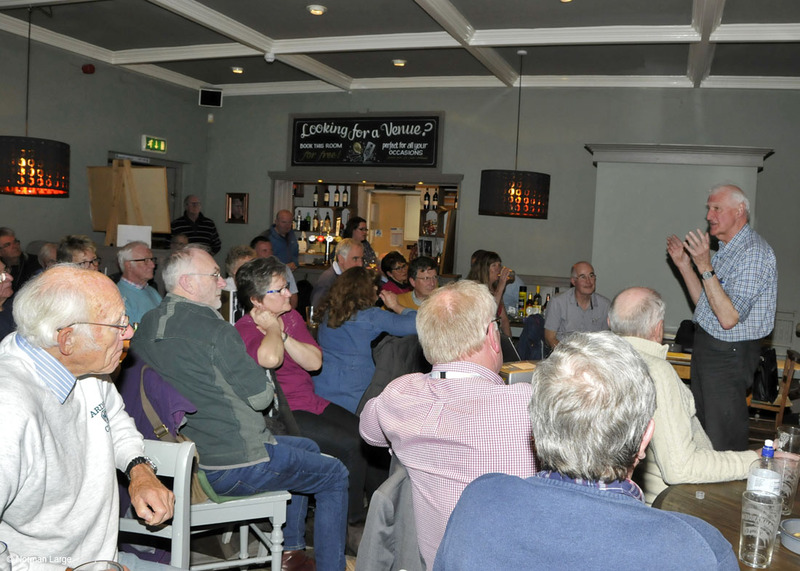 Guest speaker: 'In Praise of the Turbo Prop', based on a life flying Hercules. 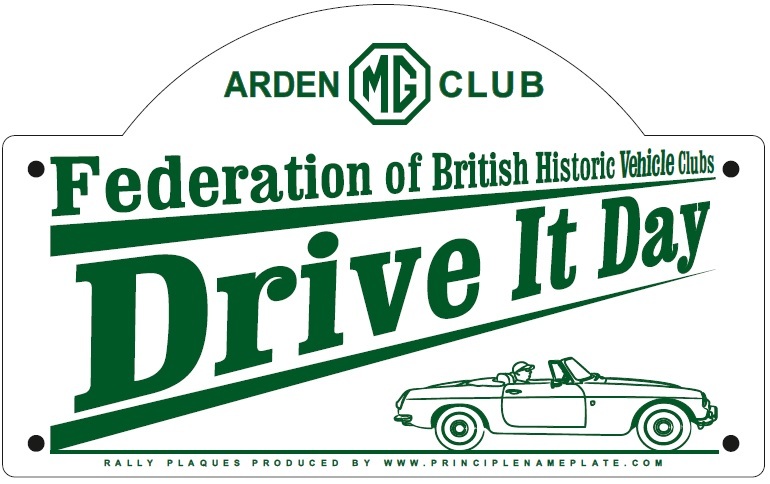 Please make cheques payable to Arden MG Club, enclose with your entry form and send to Alan by March 5th (Club Night) AT THE LATEST, however he will be happy to accept the completed forms at the Clubnight. The Cat & Fiddle, Peak District to Wrynoes Pass, Lake District. Details from Norman Verona, email: norman@frenchblat.com . What I did with my MG .....I haven't used the ZA much, but as my 23 year old grandson is on the insurance (£3.50 a year!) he used it as his daily driver all over his Christmas University break. Not a scrap of bother,....but he now appreciates how good modern heaters are! And it proved to be a great hit with some of his friends' parents! Hi Paul, happy new year to you all, what's my MG up to? Not a lot, after a very reliable & enjoyable few years of motoring, the old thing was getting a bit tired ( the car that is ) rattles mainly, still drove like an angry wasp, with a sound to match. 93k on the clock the car looks great but the engine bay!!! It required rubber gloves, that's why it got a bit ignored? I have had a new engine waiting now for 5 years, ready to go in but the decision to actually do the Job, with all it entails was something l now had to face, however the engine is now out . The suspension is being rebuilt, steering, radiator, hoses & a brake upgrade, well if l'm going to do it, it's got to be all or nothing! If all goes to plan l will finish it March/April but if l get stuck my lads will be drafted in to help, if they want to use it they can do a bit. Oli has been driving it for 2 years and loves it! Jason has a GT, l passed onto him some years ago and he would never part with it. They both thought l was nuts saying MGs ha ha. As you can see John has also sent a photo of the bike he has just finished restoring. Hi Paul -many thanks for the excellent newsletter this month (as usual I hasten to add!.) Despite having one of my now famous viral colds, over the Christmas period and beyond, I have started a number of jobs on my Midget, none finished, I hasten to add but at least it gives the impression I can multi task! I am trying to swap the rear overdrive gearbox mounting round, as I put the old one on the wrong way round last Winter (Being ill again was my feeble excuse at the time ). 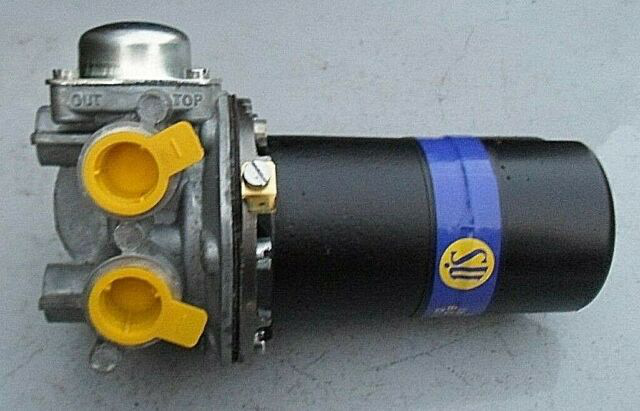 It only moves the box 4 mm to one side, but enough to stop the annoying rattle when the solenoid contacts the transmission tunnel, now and again. I did widen the tunnel when I fitted the overdrive and had no problems until last year (after refitting the engine,following painting the engine bay)!! My second job is a spark plug swap and check on the ignition - just to eliminate that from a rough running problem. Finally I'm rebuilding an old set of SU Hs 4 carbs as the current, refurbished ones are giving far too rich a mixture, despite having them set up by "an expert" (not me of course!). I shall put the old carbs back on when ready and send the refurbished ones off for attention. The old plugs are pretty sooty and the spares are a bit tired - so time to purchase some new ones, hopefully Champion N 12 YCs off Flea Bay. Just to keep me from relaxing, my pals think I need not rest in retirement, so I'm doing roof repairs for one of them - at least it pays for the MG bits! No progress this week as still getting better from this bug that's going about around here. I attach a few pics that hopefully illustrate my efforts thus far!! On another issue My Mate Steve has replaced the faulty resister on the heater switch on our TF - So now we can use the blower on No 1, 2, 3 & 4 !! - WELL done Steve & Thank You! I have also followed his instructions of fixing the "Droopy / saggy" gear lever gaiter on the TF with the use of a jubilee clip & compression spring - So No more bare shaft between gaiter & knob!! When I pulled the MGC out of the Garage to get it ready for the "Chilly Willy Run" I noticed a small pool of "oily fluid" about the size of a two pence coin where the rear wheel had stood. Not knowing what exactly was wrong I decided not to take it on the Run. I knew there could be one of several reasons what the trouble could be, a leaking shock absorber, a leaking wheel cylinder or a leaking axle seal. After closer inspection it was not the shock absorber as it was bone dry, and from the small amount of fluid on the inside of the rear brake drum it had to be the wheel cylinder or the axle seal. When I removed the rear drum the evidence was pretty obvious lots of greasy oil on the inside of the drum and the brake shoes and although the wheel cylinder was also oily, when I peeled back the rubber seal it was quite dry. So by the process of elimination the culprit was now pin pointed as the axle seal. A relatively inexpensive part but rendering the brake shoes useless as the contamination would not be possible to remove. As the wheel back plate has to be removed meaning the wheel cylinder has to be detached from the brake line I decided to renew the wheel cylinder as well. The MGC rear axle is basically the same as the MGB, with a few subtle differences. 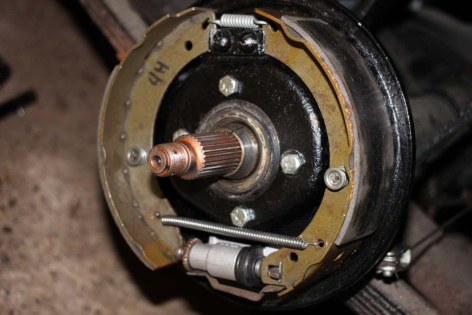 Now if you are changing one set of brake shoes it is a false economy (and quite dangerous) not to change the other side as well and the same for the wheel cylinder and also the axle oil seal . Now while all this work is being done its worth checking the Half Shafts and the Axle Bearings mine were in very good order, and the axle straps as these are often forgotten and secretly slowly perish without notice and are also quite inexpensive. (mine were on their last legs or threads). Also while doing this work I decided to do something else which had been annoying me since I first got the car but had adapted my driving to cope, namely a very annoying clunk when changing gear. 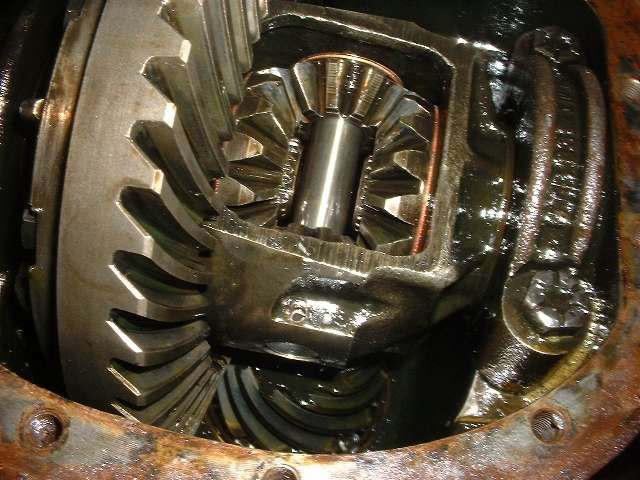 Anyone out there experienced that annoying clunk on acceleration or de-acceleration and when changing gear? If you have it's probably the cheapest repair that can be done yourself, the parts only cost around £8 although the amount of work will take around 8 / 10 hours and quite a strong nerve if you have not tackled the rear Axle or Differential before. 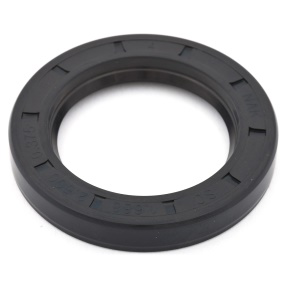 The problem is in the "Diff" and is the so called bearings (two domed copper washers and two flat fibre washers) situated behind the planet and pinion gears which act more as shims or spacers. I also changed the Pinion Pin as it showed signs of wear and a new roll pin and diff gasket. (10 hours laying on the floor of the garage in the miserable cold damp January weather wishing I was back in Barbados soaking up the warm sunshine watching the crystal blue sea lapping on the clean white sandy beach while sipping a cool beer). Thanks Roger, final instalment about the 'Click' next month. Xmas Meal:	This was reported on in the last Newsletter but went very well with the best turn-out for some years and enjoyed by all. 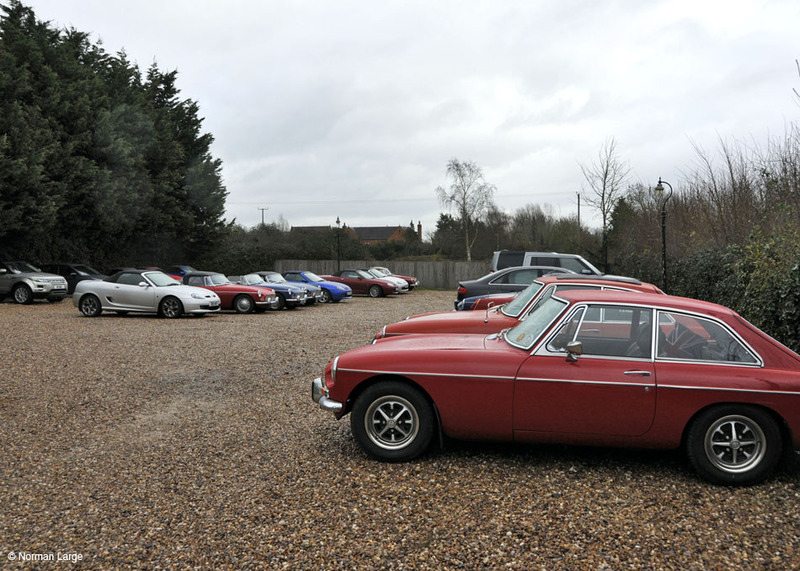 Chilly Willy Run: Good attendances are becoming normal for our events and this run was certainly no exception with over 60 people, the highest number of classic & MG cars, and some (acceptable) moderns. The start didn't go quite to plan, partly due to the more than 50% extra bookings than originally envisaged and the Potting Shed Cafe didn't reserve the whole room for us but the coffee was good. The large turn-out of MGs was no doubt helped by the mild weather but this meant we were able to enjoy a very pleasant scenic drive along some normally untravelled lanes, thanks as ever to Lech for assistance in setting the route. The Golden Cross were up to their normal high standard and the lunches were hot, plentiful and tasty, well done to Matt, Claire and their team and everyone remembered to pay for their meals!! AGM and Club Night: The AGM was well attended with 39 signing the register and it was completed in record time, less than 10 minutes. Reported were a record number of Club events in the last year, substantial funds in the Club bank account and despite reducing numbers on the Club data base (partly due to culling after the GDPR exercise) we still attracted 12 new members. The Club is in good health, minutes will be on the Club website soon. After the AGM we had 2 presentations, David had looked through the registers for all of last events (including Club Nights) to tot up who had attended the most and he found no less than 5 people with the same number of attendances, in alphabetical order: Fred Bury, Alan Cleobury, Paul Dunster, Steve Entwistle and Nigel Hook. 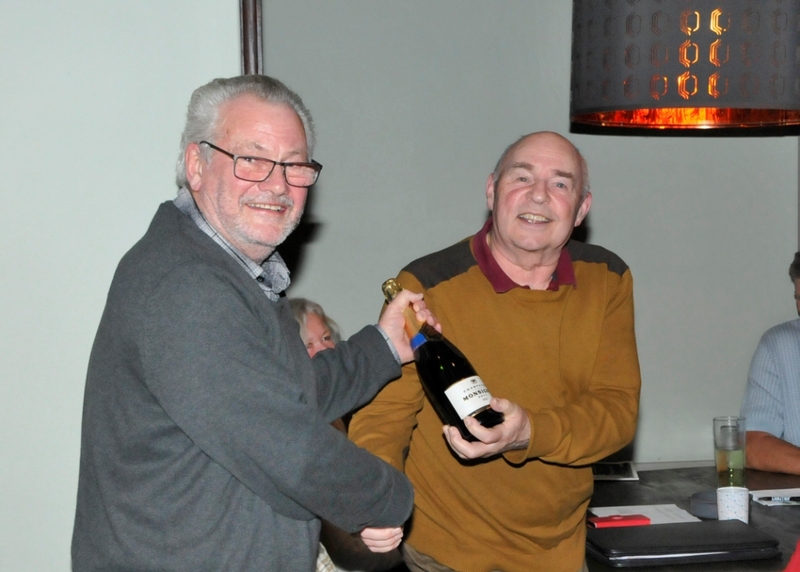 In order to present an award it was necessary to have a 'draw' to decide the winner, so the five names were put into a pint pot and Dawn drew out Nigel, who was given the bottle of Champagne, well done to all and thanks for supporting the club so often. The second presentation was a thank you, which we like to do. A lot of work was put into making the Club's 30th Anniversary go so well and one of those jobs was to come up with the idea and produce the coasters that everyone received. It was very difficult to think of something different for this recipient as he is in the field of PR but a friend of mine has a laser cutter and he was persuaded to spend a lot of time to produce an image that could be laser cut. The final image was made up of 3 layers laid over each other (thanks to Chris Jarman for producing it) and I was able to present this to Norman Large, with many thanks from the Club. Alan and the 'Team' will come up with another exciting run out, more details soon, put the date on your calendar. Richard Avery is working on this and we will have more details soon. I was persuaded to part with £25.00 for this heap of rust when we lived near Chester but we had a decent garage, shot blasting and spraying equipment, so I thought I would teach my 16 year old what I know (self taught). He now, of course knows nothing, in fact he will have try to forget my way of doing things as he is a now a Chartered European engineer, working on major projects at International airports, however since I couldn't get him to give me £50 for the car (well one must try to make a profit in life) I had to let it go for the £25 paid and that was on the never never. We took it apart found the wings were partly old oil cans cut up and all sorts of other bodges, worst of all were the sills of course, however we welded new sills in and repaired the rest of the body as best we could Not liking the original yellow colour we sprayed it blue, took the engine out to paint the engine bay (no engine hoist then just a trusty bit of rope strung up over a wooden beam in the garage) ground the valves in, stripped and cleaned the carbs, added new plugs and all the usual then put it all back together. With a new battery, away it went. My son drove it around for a week and then announced he and a friend were going camping, in Luxembourg!! They piled up all the camping gear into the boot with all the other odd available spaces and off they went. Naturally I was on tenterhooks, since he wasn't an experienced driver, with the new rebuild and not much testing, would it all be alright. Anyway the only problem was a minor leak in the petrol tank which a local garage fixed, would you believe this they welded a patch on the tank which was full of petrol! That lasted for a couple of months, however the day after they got back he started to drive away to go to work and the clutch release bearing failed so they were very fortunate that didn't happen on their trip. 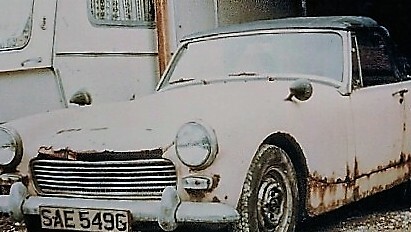 My son continued to use the car which proved very good in the long term until it was MGB time but at least we knew how to deal with rusty sills by then and I think we did three of those as well as an MGC, when we moved down to Worcestershire. Thanks Phil, I think we have all been there in one way or another!! I have not done much with the 'B' this month except for a good wash after the Chilly Willy Run, the cover is back on awaiting warmer weather. What have you been doing? Send me a photo and a few words. I have used all the stories to date but it is not too late to send me your MG story, if you have enjoyed reading the previous stories everyone will be interested to read yours, don't forget to include a few photos.